The FIA has rejected claims that Kimi Raikkonen should have been punished for his crash in the British Grand Prix, and that the red flag delay was too long. The Ferrari Formula 1 driver crashed heavily on the opening lap after he lost control of his car as he rejoined the track on the Wellington Straight. 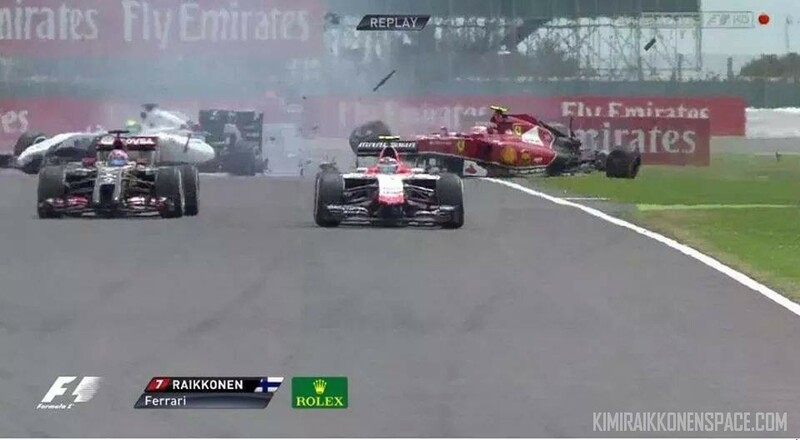 There have been suggestions that the fact Raikkonen crashed after rejoining the circuit means he should have been punished for what happened. AUTOSPORT understands that while the FIA did look in to the incident, it decided that Raikkonen had not rejoined in an unsafe manner. Telemetry data shows that, after leaving the track at 230 km/h, Raikkonen did scrub off some speed as he returned to the circuit, before his car was unsettled by a bump as it ran through a patch of grass. Although the FIA accepted that Raikkonen would not have crashed if he had slowed down dramatically, it is understood the governing body believed that any other driver would have rejoined the track in the same manner. Raikkonen’s impact with the crash barriers was registered at 160km/h, with a peak of 47G. Ferrari should be sanctioned for providing such a rubbish car to Kimi this year!